In any list of great eccentrics, the colourful socialite Florence Foster Jenkins must be near the top. Peter Quilter’s affectionate and hysterical play with music follows the true story of the legendary Ms Jenkins as she barnstorms her erratic way, against the odds, to a remarkable sold out solo concert at The Carnegie Hall in 1944, with a programme that showcased her truly unique, oh so unique, vocal talents. Trailing in her flower strewn wake is an equally eccentric troupe of loyal friends, lovers, pianists, maids and critics; and let’s not forget Ricky, the very odd dog. Come and relive that unforgettable night as Florence, bedecked in her extravagant finery, once again, attempts to silence her critics and raise the roof with a voice that she, for one, would call Glorious. "Caterwauling singer reaches Carnegie Hall"
What do you call a self-styled Diva without talent? An anti-Diva? Such a person really existed in the form of Florence Foster Jenkins who, in 1944, the last year of her extraordinary life, packed the Carnegie Hall with fans who relished her caterwauling. 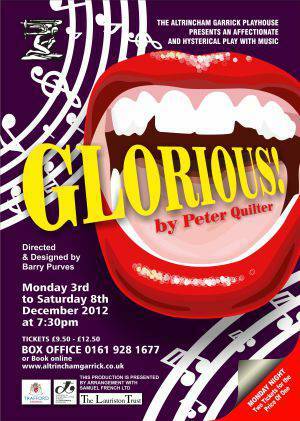 Peter Quilter's play, Glorious, defines her achievement and shows how a personality as large as hers can overcome any vocal impediment and lack of pitch or rhythm. She was rich and eccentric enough to defy criticism and used her money to buy performances in great places. It takes someone almost as extraordinary as Florence to fill the role. It has to be a lady with oodles of charisma who doesn't mind dressing eccentrically and who, like pianist Les Dawson, can perform completely out of tune. You have that person in the form of Alison Davis who, in a Hyacinth Bucket style performance, takes the Garrick by storm, her powerful presence overpowering everything else. Alison is the perfect choice for the part and I hand it to whoever selected her for their wisdom in doing so. The play begins with Florence interviewing her eventual accompanist, Cosme McMoon (David Jones), an accomplished pianist, who patiently adjusts his notes to suit hers and often saves the day as a result. It is he who describes the event at Carnegie Hall with such eloquence. David's performance, both as actor and pianist, is presented with a flair which makes it look easy. It patently isn't! There is a funny scene where he is stuck on the chaise longue between two larger than life ladies, one the diva herself, the other her best friend, Dorothy. Dotty would be a better name, for Dorothy is almost as mad as Florence as she trots around with her little dog (not real). Celia Bonner is truly versatile - for her last role was as Mrs Danvers in Rebecca! Another true friend is partner St. Clair. David Reynolds obviously relishes the role of the very English theatrical luvvy who believes in Florence almost as much as she does herself. You don't feel guilty when you laugh at Florence's performances because you are laughing with her rather than at her. Musicians will enjoy the show as much as the less musically inclined. It's a fun evening. In 1940's New York, the performer who everyone wanted to see in concert was none other than Madame Florence Foster Jenkins, an enthusiastic soprano whose pitch was not only far from perfect, she had no rhythm and frankly, could not sing! Florence shrieked, squeaked and screeched her way through classic opera recitals, but what the hell, she loved it and more than 60 years on, so do we! Based upon a true story, the play spins from Florence's charity recitals and extravagant Gala?s, through to her bizarre recording sessions and an ultimate triumph at Carnegie Hall in this hilarious and ultimately heart-warming comedy. Alison Davis played 'the first lady of the sliding scale' ? as she was known ? as she warbled to the audience who? mostly fell about with laughter. This delusional and joyously happy character pays little attention to the critics,???? instead she?s surrounded by a circle of devoted friends who are almost as eccentric as she is. From reading a little about Florence, Alison was everything you?d expect, an enormous character you can?t help but adore, we were given a very inspiring performance of a woman who simply wants to do what she loves! The???????????? determination and passion was clear in her performance and the comic delivery hit all the right notes, even if the singing didn?t! Alison was supported by a tremendous cast; David Jones as Cosme McMoon - Florence?s new pianist whom she?s rescued from playing background music at a noisy buffet ? was superb, over the course of the play David beautifully demonstrated how he grew to love Madame Jenkins?s jolly spirit, her sweet nature and her apparent obliviousness about her singing, the public's reaction and his homosexuality. His narrative description of the Carnegie Hall triumph and Florence?s death within five weeks of the concert was a touching finale. Celia Bonner was delightfully endearing as Florence?s loyal, dizzy friend Dorothy, she was whacky and whimsical and equally as crackers as the star, a creditable - Emma Chambers esque - performance. Victoria Johnson was more than convincing as the irate Mexican maid, not an easy role to carry but was effortlessly?portrayed and consistent. Pat Williamson?s performance as Mrs Verindah-Gedge cannot go unmentioned, this is a great cameo which was?? expertly played and evidently enjoyed by all. Finally, David (Niven) Reynolds gave an inspiring portrayal as Florence?s older lover St. Clare, for me, probably the most interesting character of the bunch who instantly had me questioning why he is with her, does he love her or is it the convenience of an easy life that?s keeping him there? The role is clearly written as a womaniser but David?s camp flourishes worked, particularly in his scenes with Cosme where the energy between the two literally bounced off them. Layers of interest were added to a character that could easily come across as bland, stereotypical and?almost meaningless, David injected flair and intrigue into his performance, maximising every possible aspect of the character to which he made himself perfectly suited, a true testament of a brilliant actor. Direction by Barry Purves was crisp and precise, the delivery of the piece was well balanced and gave credit to this fabulous play, I particularly loved the plays final ?magic ? moment as an original recording of Madame Jenkins plays which segued into a stunning (how she hears herself) recording, a charming moment. The entire evening was glamorously bonkers, you cannot help but adore this show! The story is heart-warming in how Florence?s love of music and eccentric enthusiasm was so contagious that it made up for her complete lack of talent. A play and production that was nothing less than?Glorious!